Happy new year to all our couples and industry colleagues. 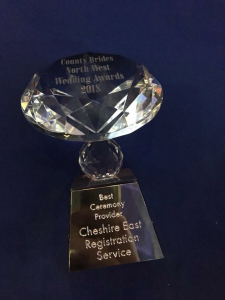 As one year ends, it’s time to reflect on what a successful and enjoyable year it has been for us at the Cheshire East Registration Service. 2018 saw the centenary of women’s right to vote. 1918 saw 40% of women attain the vote for the very first time. It would be another 10 years before all women over the age of 21 would be granted that right. We of course owe this right to the Suffragettes. You are probably wondering what the Women’s Right’s Movement has to do with the Registration Service. The Suffragettes most famous member, Mrs Emmeline Pankhurst was a Registrar, so it would have been remiss of me not to mention the centenary. Winning the award brought us a huge buzz going into our hectic and jam-packed summer months. With over 300 weddings booked into our diary for August, we knew that we were going to be busy bringing joy and love around the county. We have been so lucky to have met a massive array of wonderful people from all manner of walks of life; and for me that’s my favourite part of this job. We meet some truly loved up, fabulous people and it really is an honour to be part of their celebrations. We also get to work with some pretty amazing industry colleagues as well. And just when I think I have seen it all at a wedding, I get blown away with the new and unique ways couples enhance and celebrate their big days, such as the Wedding Painter, Stuart that two of our ladies encountered at a ceremony at Owen House and the Storm Troopers that were spotted at the same venue (but at a different ceremony). I anticipate that we will be privileged to see many new things next year. 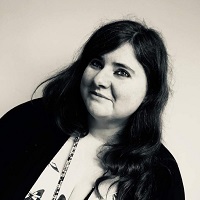 In October we welcomed a new member of our team, Hannah as a Deputy Registrar. I think I am not alone is saying that she has been a brilliant addition to our office and that she has settled in immediately, and is an absolute joy to work with. She’s yet to register or conduct any wedding ceremonies, but I think you will see her out to ceremonies soon! In November our very own Marriage Officer, Helen, tied the knot with partner Louisa. Myself and Julie B ( with Hannah observing) were tasked with getting the loved up pair married, and it was a lovely affair. I have to say, asking Helen to sign the marriage register under the couples section was a bit weird! Looking forward to 2019, there is a second office marriage as our Superintendent Registrar Julie Hadfield will be marrying fiancé James. After the many years of marrying couples, I imagine it will be very different walking up the aisle, rather than waiting for the bride to be at the top. We have had an absolute ball in 2018 and as much as we are sad to see it end, we can’t wait to do it all again in 2019! If like our Julie you are getting hitched this year, we can’t wait to meet you for the best day of your life!